My sweet cyber daughter Chesca gave me this cute friendship award. Thank you so much anak, this is so sweet. I'd love to share this with Chubby, Gagay, Gelene, Laura, Monica and Maya. 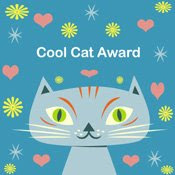 The cool cat award came from a new blogger friend Maya. Promise! I didn't laugh. ;) I'm sharing this with my anak, Chesca. Hope you like it sweetie. 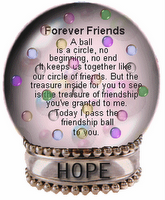 This forever friends award came from Monica. Thanks sis, I'm glad you're my friend too. I'm passing this to Emmyrose, Redrogue and Yvelle. Wow- you always have so many awards. Congrats!